For Glock 17, 22 and 31 models, the Don Hume H721 Open Top is a high riding, canted, outside the waistband leather holster. 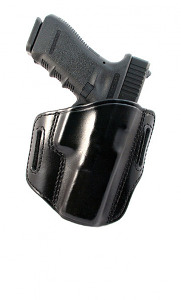 The H721OT is excellent for concealment and all day carry. This design features a slide guard to provide comfort by protecting your skin from the slide. Will fit belts up to 1.75 inches wide.